HDMI 2.1 was announced last January with support for up to 10K @ 120 Hz while using Display Stream Compression (DSC) and new 48Gbps cables, as well as other improvements. 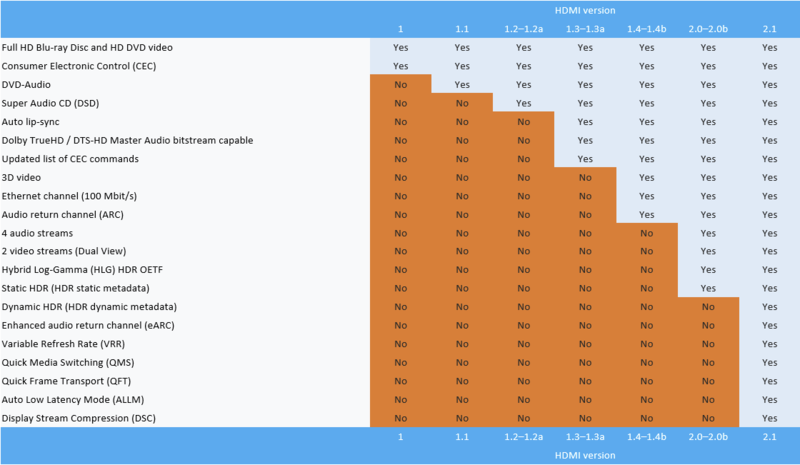 The HDMI Forum has now released version 2.1 of the HDMI specifications. 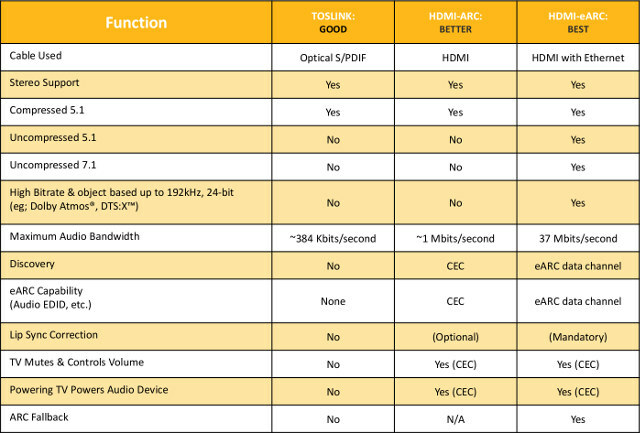 The detailed specifications are only available to HDMI adopters, but an overview of the specifications can be downloaded by simple mortals. 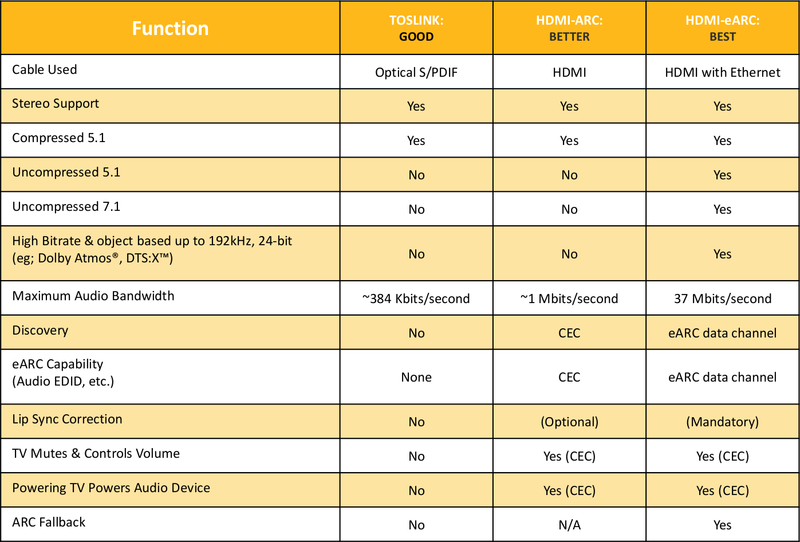 Enhanced audio return channel (eARC) – eARC supports high-bitrate home theater audio formats, object-based audio, uncompressed 5.1 and 7.1, and 32-channel uncompressed audio thanks to up to 37 Mbps audio bandwidth. Variable Refresh Rate (VRR) – Syncs up source and display with continually changing refresh rate, up to a frame-by-frame basis. The frames are transmitted as soon as they are rendered in order to reduce or eliminate interaction lag, stutter, and tearing. Quick Media Switching (QMS) – A source device can instantly switch the resolution or frame rate of its content without any display blackout, for example when switching from 60 Hz to 24 Hz to watch a movie. A QMS-capable display will be able to seamlessly vary refresh rate, switch resolution, and select the correct viewing mode. Quick Frame Transport (QFT) – Each video frame travels faster from the source even though the source does not increase its frame rate and results in deceasing latency. This reduces lag for gaming, real-time interactive virtual reality, and enables more responsive karaoke. HDMI 2.1 also introduces the “Ultra High Speed HDMI cable” necessary to handle up to 48 Gbps data for higher resolution and frame rate. 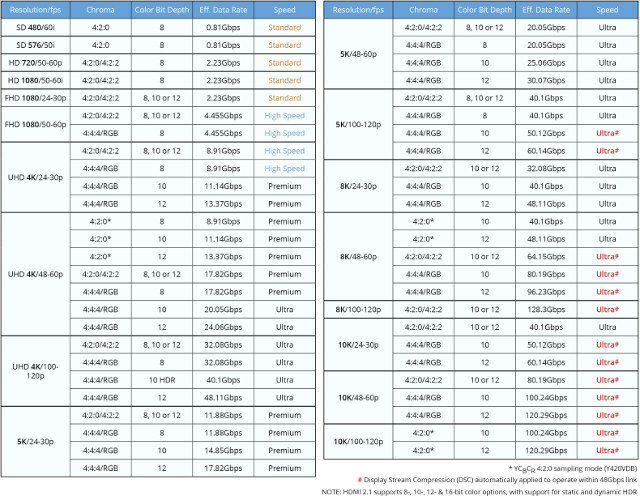 The previous “High Speed HDMI cable” limited to 18 Gbps was suitable for all HDMI versions up to 2.0, and the new UHS cable is backward compatible for older versions. That means you’ll be to purchase a Ultra High Speed HDMI cable for all resolutions above where Premium/High Speed, or Standard cables are not suitable. 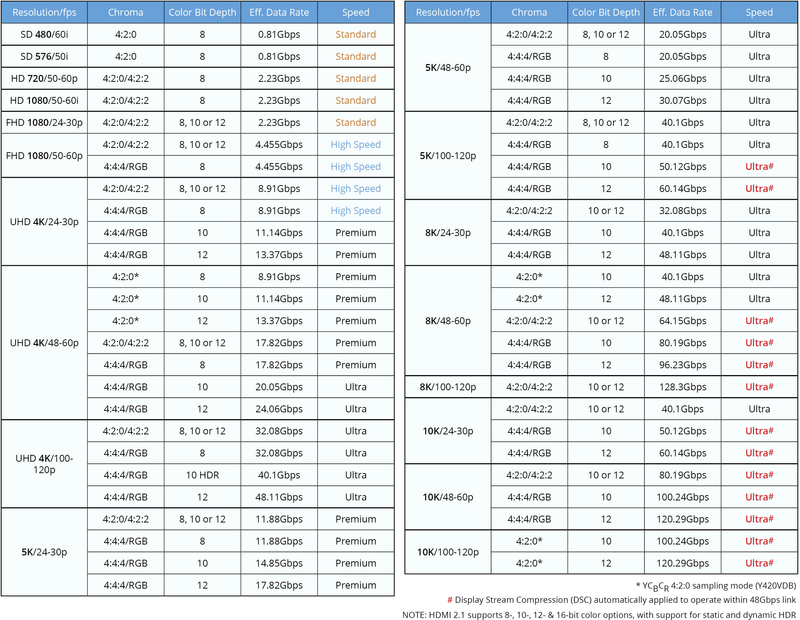 HDMI 2.1 Specification to Add Support for 4K @ 120 Hz, 8K and 10K Resolutions. New 48G Cable Required.